Jesus returned to Nazareth, the town of his youth. He spoke in the synagogue, but the townspeople did not like what he said. They hurried him unceremoniously out of the town. Nazareth would have looked something like thisNazareth is famous for one thing, and one thing only: it was the home town of Jesus. Here Jesus spent his boyhood living with his mother and father, and here that he faced the sceptical townsfolk of Nazareth. 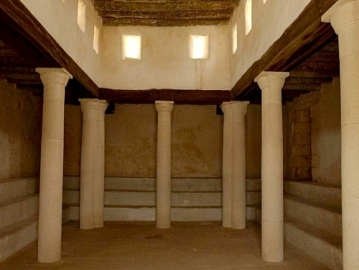 The village seems to have been held in some contempt in 1st century Palestine – a nondescript dot on the map with not much to offer, overshadowed by nearby Sepphoris, the luxurious Greek-style capital recently built by Herod Antipas. It is beguiling to think that Joseph and Jesus, as builders, may have traipsed daily over to Sepphoris to work on the new city. But time had passed. There was no mention of Joseph in the gospels at this point; it must be presumed that he had died (life expectancy was low) or was away working as an itinerant craftsman. Mary may have been a widow; she seems to have been head of the family. The adult Jesus must have returned to his village a number of times to see his family, but this time there was an incident recorded in all three Synoptic gospels (Matthew, Mark and Luke). Nazareth could not boast many celebrities among its population so when Jesus, now a charismatic and famous teacher, returned home he was at first greeted warmly. He had left Nazareth as a private person; now he returned as a Rabbi, accompanied by scholars and disciples. He went to the tiny synagogue. 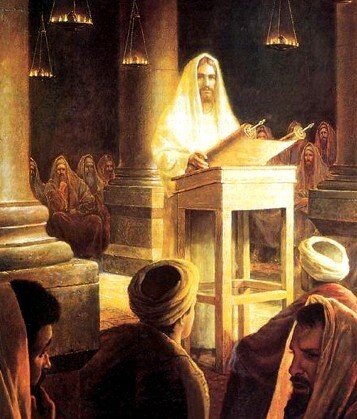 The usual service consisted of prayers, readings from the Law and the Prophets, and a sermon. Any competent man present could lead the service. Jesus’ audience was at first impressed by what he said. and that the time of God’s salvation had arrived. The people of Nazareth (and we may assume the synagogue was full) were startled at first, then hostile. They took exception to one of their own making such grandiose claims. It may have been that, like many men whose birth was shadowed, Jesus had never been entirely accepted by the people he grew up with. But someone in the congregation must have urged the others to give Jesus a chance. If he could show some tangible proof of his claims, then they would give more thought to the matter. They had heard he cured the sick in nearby Capernaum. Let him do the same here in Nazareth. unconditional faith on the part of the person who wished to be cured. These were not present in the people of Nazareth, and the gospels record that Jesus ‘could do no mighty works’ at Nazareth. The people of Nazareth turned on him and ran him out of town. One of the gospels says that, in the ensuing mêlée, the rougher element among the villagers tried to kill him. 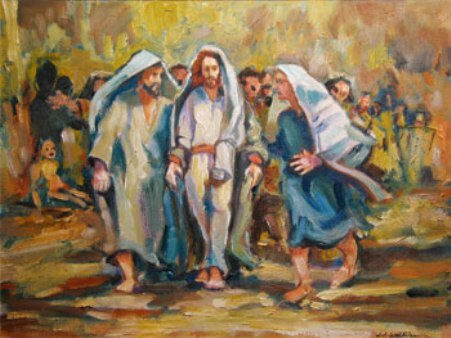 The painting by Jeff Watkins (above) shows the tumult of the moment, as Jesus is hustled and jostled out of Nazareth. The artist has captured the energy of the moment: Jesus is trying to leave, but is hemmed in and urged forward by the vigorous, angry men who abuse him. Are these the people he grew up with? It was probably someone in this group who referred disparagingly to Jesus as ‘the son of Mary’ and ‘the carpenter’s son’ (see the passages from Matthew and Mark below). A Jewish man was normally referred to as ‘the son of (his father’s name)’, and we would expect Jesus to be called ‘the son of Joseph’. Calling him ‘the son of Mary’ implied Jesus could not even name his own father. This particular gospel story was reassuring for the early Christians. They too were being rejected by their Jewish neighbours. They could take heart, as we can, from the fact that even Jesus was rejected by people he had known and trusted all his life. 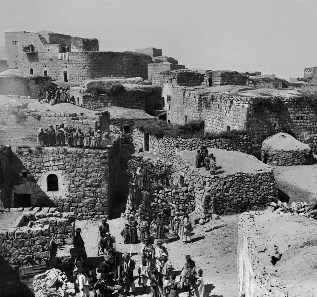 The incident at Nazareth cannot have been a happy experience for anyone, especially Mary, who may have understood the villagers’ resentment but was forced to watch her son being vilified. aisle space behind the columns, lined with seats and benches. 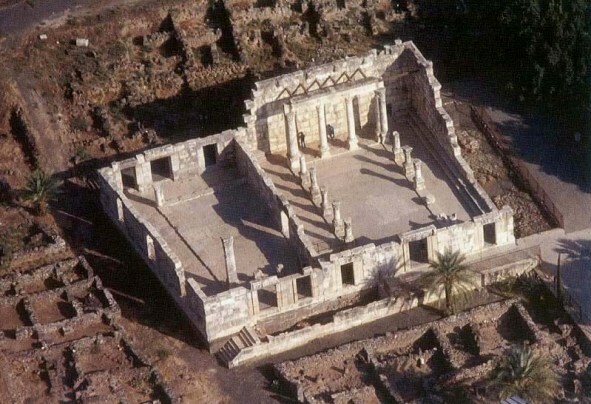 This magnificent lime-stone synagogue was one of the largest and best-built of the Byzantine Period. 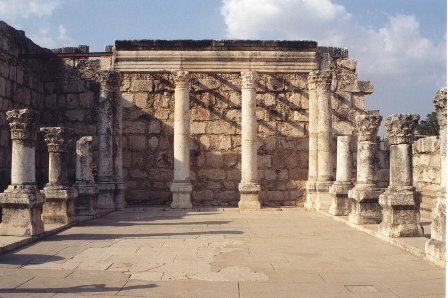 Its walls, pavers and columns were made of white limestone from further west in Galilee, and contrasted sharply with the dark grey basalt stone of earlier buildings on this site. 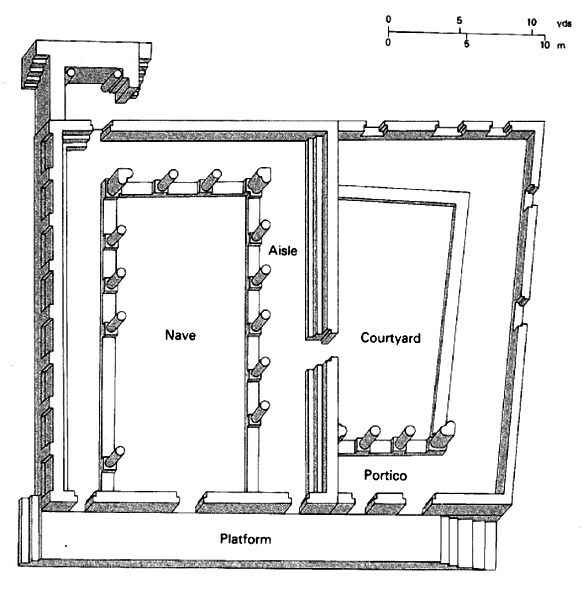 The main room was flanked by two tiers of seats on the eastern and western sides, divided by two rows of columns. Note: Jews at that time, before synagogues became popular, met in other places – an open square, a large house’s courtyard, an affluent person’s residence. Nazareth, poor as it was, may only have been able to offer this sort of setting to Jesus when he returned to his home town. The word ‘synagogue’ refers primarily to a gathering of people, and only secondarily to a formal structure – something that Jesus would have understood. would have been smaller and more modest in design. and many who heard him were astonished, saying, “Where did this man get all this? What is the wisdom given to him? What mighty works are wrought by his hands! 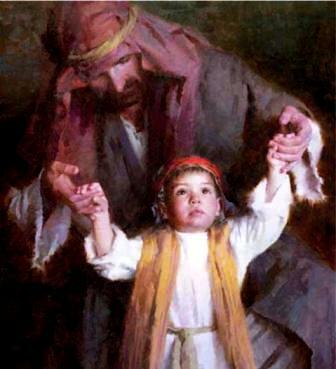 5 And he could do no mighty work there, except that he laid his hands upon a few sick people and healed them. 6 And he marvelled because of their unbelief. Luke 4:16-30 16 And he came to Nazareth, where he had been brought up; and he went to the synagogue, as his custom was, on the Sabbath day. 23 And he said to them, “Doubtless you will quote to me this proverb, ‘Physician, heal yourself; what we have heard you did at Capernaum, do here also in your own country. '” 24 And he said, “Truly, I say to you, no prophet is acceptable in his own country. 25 But in truth, I tell you, there were many widows in Israel in the days of Elijah, when the heaven was shut up three years and six months, when there came a great famine over all the land; 26 and Elijah was sent to none of them but only to Zarephath, in the land of Sidon, to a woman who was a widow. 27 And there were many lepers in Israel in the time of the prophet Elisha; and none of them was cleansed, but only Naaman the Syrian.” 28 When they heard this, all in the synagogue were filled with wrath. 29 And they rose up and put him out of the city, and led him to the brow of the hill on which their city was built, that they might throw him down headlong. 30 But passing through the midst of them he went away.